The fifth and final film in our Free Horror Movie Series will be…. “The Rev. 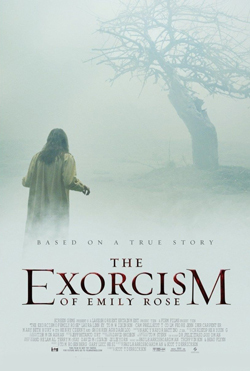 Moore is prosecuted for the wrongful death of Emily Rose (Jennifer Carpenter), a girl thought to be demonically possessed, because he administered the church-sanctioned exorcism that ultimately killed her. This horror classic will be screened on Saturday the 30th September 2017, 9PM on our Drive-In Movie Screen near Chepstow. 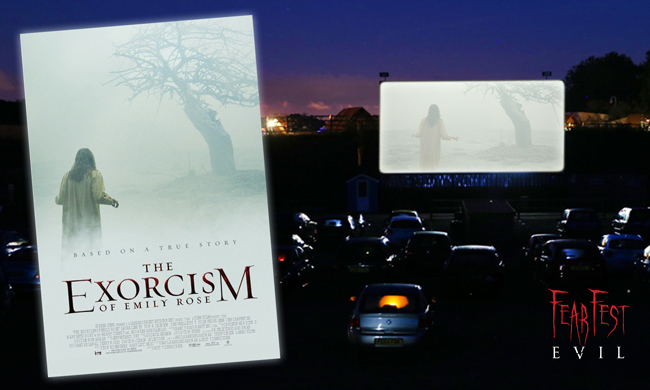 This film is part of a series of FREE horror movie screenings at our Drive-In Cinema. They are to celebrate the launch of FearFest-Evil​ and to get you in the mood for horror! Every Saturday during September we are screening a classic horror movie at 9pm for free – That’s five free nights of horror!! To book your free tickets you will need a redemption code. These will be released on our social media channels. The films will be screened at our Drive-In Cinema, Chepstow at 9pm on the 2nd, 9th, 16th, 23rd and 30th September 2017. Places are limited and will be allocated on a first come, first served basis. Entry limited to one car per booking. 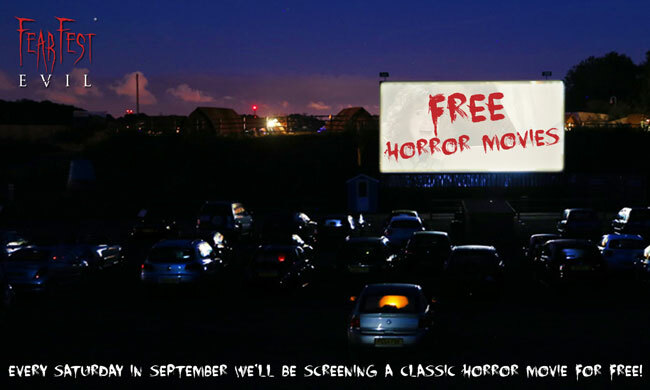 To celebrate the launch of FearFest-Evil​ and to get you in the mood for horror, we are hosting a series of FREE horror movie screenings at our Drive-In Cinema in Chepstow. Every Saturday during September we will be screening a classic horror movie at 9pm for free – That’s five free nights of horror!! To book your free tickets to the Drive-In Cinema you will need a redemption code. We will be releasing these codes, along with the film names, on the FearFest-Evil social media channels. For now, block out the September Saturday nights in your diaries, share this post with your friends and make sure you are following FearFest-Evil on our Social Media channels for the horror cinema redemption codes. The films will be screened at our Drive-In Cinema, Chepstow at 9pm on the 2nd, 9th, 16th, 23rd and 30th September 2017. Places will be allocated on a first come, first served basis. Entry limited to one car per booking.